Friskies and the iconic Grumpy Cat are back at SXSW for a fourth time, this year introducing a new product with some musical accompaniment. To support the introduction, there will be a musical mashup performance from Ryan Cabrera and Blake Lewis. Cabrera, who was in the band Rubix Groove, is known for his up-tempo pop-rock. Lewis is a singer, songwriter and beatboxer who was the runner-up on the sixth season of "American Idol" in 2007. The product, Cat Concoctions, features interesting flavor combinations that could only come from the minds of cats, says Jessica Nichols, Friskies brand manager. 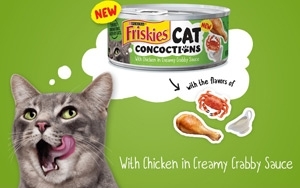 Friskies Cat Concoctions features flavor varieties that include a mashup of unexpected flavors that only a cat could think of, such as: Chicken in Creamy Crabby Sauce, Cod in Cheesy Bacon Flavored Sauce, Lamb in Clam Flavored Sauce and Scrumptious Salmon & Chicken Liver Dinner Pate. The brand’s activities at the Austin-based festival include a photo booth where guests can use Cat Concoctions-inspired props to capture quirky photos with Friskies’ “official spokescat” Grumpy Cat or take a mirror selfie of their face mixed with Grumpy Cat’s distinguished frown. #CatConcoctions presented by Friskies is open to the public on March 12 and March 13 from 11 a.m. to 6 p.m. CT. Grumpy Cat’s appearance schedule is from 11:30 a.m. to 1:30 p.m. and 3:30 p.m. to 5:30 p.m. both days. People who cannot attend can still follow the action on Friskies’ Instagram and Snapchat accounts and join the online conversation using#CatConcoctions.